"Beautiful picture, wonderful source material, but a confusing storyline cause Disney to miss their target market"
Tchaikovsky’s The Nutcracker ballet and its score have become synonymous with Christmas celebrations around the world. Adapted from E. T. A. Hoffmann's story "The Nutcracker and the Mouse King”, the fantasy of a young girl, her favorite toy and the battle with the Mouse King are on stages everywhere at this time of year. The story has been adapted for the big screen in different forms with a limited degree of success. Disney and director Lasse Hallström (A Dog’s Purpose) have decided to have a crack at their own adaptation of this childhood classic. The focus of the original magical tale of toys and mice coming to life, Marie Stahlbaum (Anna Madeley) has grown up, had a family and recently has passed away. While her family grieves at Christmas for the loss of their mother, Their father gives each child a gift from their departed mother. Fritz (Tom Sweet) receives toy soldiers, Louise (Ellie Bamber) gets her mother’s favorite dress and Clara (Mackenzie Foy) receives a cryptic note and beautiful decorative egg that requires a unique key to open which is not with the gift. The family goes to an annual ball at their godfather Drosselmeyer’s (Morgan Freeman) home where they all are given an opportunity to discover a Christmas gift within his mysterious house by following a golden thread that is marked with their name. 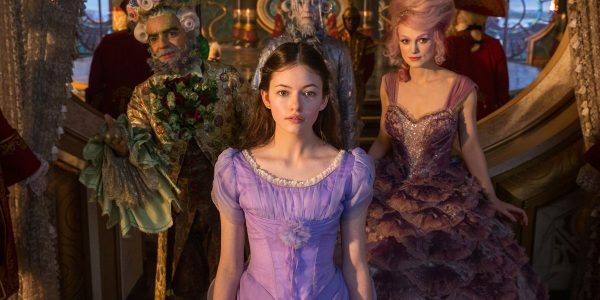 [caption id="attachment_104237" align="alignnone" width="800"] Mackenzie Foy is Clara in THE NUTCRACKER AND THE FOUR REALMS[/caption] Clara follows the particular line into a fascinating realm that exists in a parallel universe in her godfather’s home. Here the young girl finds the key, but then loses it to a mouse, who answers to the tyrannical leader of the fourth realm, Mother Ginger (Helen Mirren). Her only hope to regain possession of the key is to partner with the Nutcracker (Jayden Fowora-Knight) and the regents who preside over the other three realms, which she comes to find out were created by and ruled over by her mother as queen. The special key not only opens the young girl’s gift, but is the means for the other regents to start the machine that can help to defend their lands from Mother Ginger. With Philip the Nutcracker’s help, Clara goes on a quest into the Fourth Realm to get back what is hers and to help her new found friends, but manages to discover that not is all as it seems in this land of sweets, snowflakes and flowers. The challenge with telling the next chapter of a beloved story that has influenced countless generations is maintaining the magic that drew people to the tale initially while introducing something new. Reminiscent of Tim Burton’s feat with his 2010 adaptation of Alice in Wonderland and hoping for the same level of success, Lasse Hallström struggles to make this re-imagined journey capture the charm of the classic fantasy adventure. There is no escaping the visual smorgasbord that is laid out for this fantasy adventure. The initial beauty of this world of apparent happiness and joy is undeniable and does allow families to enjoy a stunning world of magic, but the eye-popping colors cannot make up for a confusing storyline. Parents may be looking for a family-friendly option this season and it would seem with the combination of Disney with The Nutcracker, this should be a great choice. Thankfully there is little objectionable material for children, but that does not mean that this is an excellent choice for children. The young ones will prove to be disengaged quickly and potentially scared by some of the content while everyone else will wonder what is happening on screen because of a discombobulated script and underdeveloped characters. For fans of the ballet, the accomplished dancer, Misty Copeland, provides an exceptional performance in amongst the storyline, but it does not do enough to save The Nutcracker and the Four Realms. Even the young girls that seem to be the target audience may find that the aesthetics are not enough to keep their attention through until the end. For a tale that has a special place for many during the Christmas season, this film has little to do with the holiday and even less for families to celebrate as an entertainment choice. 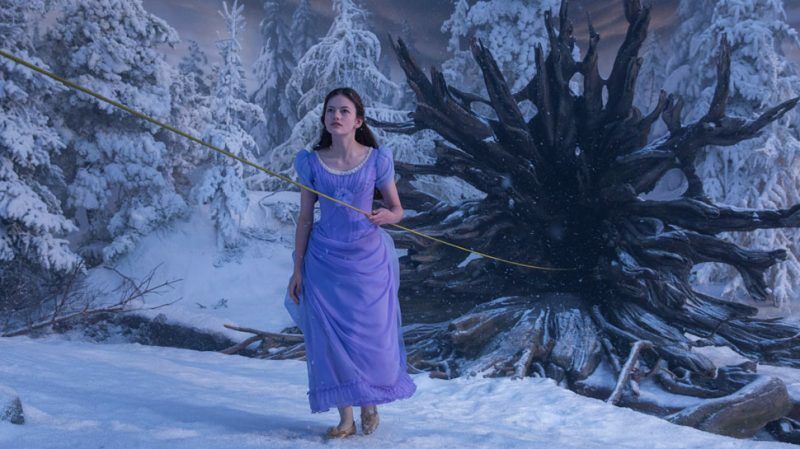 What opportunity will parents have after watching The Nutcracker and the Four Realms with their children? What looks like a story of youthful and female empowerment is really masking a message of self-belief. Even though there is an undertone of family and love, the story is overshadowed by a bizarre look into the world of spirituality that excludes God completely. Even though this film is designed for adolescent girls, the whole experience will be challenging for adults to grasp. Between the mixed message of the screenplay and the indiscernible elements, it makes this a film that most families should give a miss. For the sake of the family's time, it would be better to go to the ballet or read the original story together and have some fascinating discussions about family, time, love and real sacrifice.